*For the CDOT pilot, payments were simulated and no money was exchanged. What are some potential benefits to RUC? RUC helps re-establish equity among drivers by having them pay for their use of the roads, as opposed to only the gas they consume. By doing this, RUC can also provide a more sustainable funding source for Colorado to use to improve the conditions of its transportation system. What is the CDOT RUC Pilot Program? One hundred people participated in the pilot program. The Colorado RUCPP lasted four months&mdashfrom December 2016 to April 2017. CDOT simulated a per-mile charge of 1.2 cents per mile driven and simulated credits of any state gas taxes paid. Three mileage-reporting options were available for participants to choose from: two technology options; and one manual odometer reading option. Why is Colorado evaluating a road usage charge? Colorado's annual funding for transportation can no longer keep pace with the costs of operating, maintaining and improving the statewide transportation system. A recent needs-and-gaps analysis, conducted as part of the 2040 Statewide Transportation Plan, showed an estimated gap of nearly $1 billion annually over the next 25 years. Much of the revenue required to preserve, maintain, repair, and operate Colorado roads comes from state and federal gas taxes. These taxes (18.4 cents per gallon federal, 22 cents per gallon state) are fixed amounts that do not fluctuate with the price of gasoline. Colorado voters have not increased the state gas tax since 1991, and the federal gas tax has not been raised since 1993. As cars become more fuel efficient, less gas is being purchased and fewer gas taxes are being paid, resulting in a decline in the monies needed to repair and maintain Colorado roads. This problem is enhanced with emerging alternative fuel vehicles that pay little to no gas tax. The gas tax is no longer a sustainable funding source as fuel efficiency standards rise, and the number of hybrid and alternative fuel vehicles (such as electric vehicles (EVs)) are paying little or no gas tax. RUC allows drivers to pay based on the number of miles they drive, providing a direct correlation between each motorist's use of the transportation network and the amount he/she pays to support the system. It helps to ensure that everyone using the roadway network pays their fair share. *Paid amounts are calculated assuming 1,000 miles traveled per month at an estimated rate of 1.2 cents per mile. **Under a RUC program, drivers will be reimbursed for state gas taxes paid. Note: These numbers don't take into account the overall fuel-economy fleet mix in Colorado. How much is the current Colorado gas tax? The current Colorado gas tax is 22 cents per gallon. In addition, the federal fuel tax is 18.4 cents per gallon. Gasoline is defined as any flammable liquid used primarily as a fuel for the propulsion of motor vehicles, motor boats or aircraft. This includes conventional gasoline and several derivate blends. What about alternative fuel vehicles such as diesel? The Colorado RUCPP focused on gasoline, hybrid, and electric-powered passenger vehicles only—no heavy-duty trucks, recreation vehicles, motorcycles or other alternative-fuel vehicles. Will RUC cost me more than the gas tax? For the Colorado Road Usage Charge Pilot Program (RUCPP), all RUC payments were simulated. In general, the cost difference between RUC and the gas tax depends on your vehicle's fuel economy. Find information on the EPA's average MPG rating for your vehicle. Who participated in the Pilot Program? Anyone was able to sign up for the program as an "Interested Party" by simply registering on this website. All interested parties were considered for participation in the Colorado RUCPP; however, CDOT placed restrictions on participants to maximize geographic and vehicle fuel-efficient diversity. The Colorado RUCPP focused on gasoline, hybrid and electric-powered passenger vehicles only—no heavy-duty trucks, recreation vehicles, motorcycles or other alternative-fuel vehicles. What information did CDOT receive about participants driving? CDOT took special precautions to ensure no information about vehicle use—including vehicle location, specific routes driven, driving behaviors or other vehicle information—was exchanged over the course of the pilot or afterward. CDOT partnered with Azuga, a well-established industry-leading account manager, which is currently providing RUC account management services in both California and Oregon. Every month, CDOT received aggregated vehicle-mileage reports from Azuga. The only participant-specific information CDOT received was based on each participating vehicle's vehicle identification number (VIN), provided when a participant signed up with Azuga. Is Colorado the only state considering a Road Usage Charge? No. In addition to Colorado, several other states are evaluating the feasibility of RUC—and some are even launching RUC programs. Oregon and California have already conducted feasibility studies and have passed legislation for large-scale RUC pilot programs. Other states, like Colorado, Hawaii and Washington, are also preparing for pilot programs. Elsewhere, Indiana, Wisconsin, Michigan, Illinois, Maine, Delaware, and Florida are studying or investigating per-mile charging for roads. Colorado is a member of the RUC West (also known as the Western Road Usage Charge Consortium), a coalition of 14 western state departments of transportation that are committed to collaborative research and development of a new method for funding transportation infrastructure based on drivers' actual road usage. All in all, over 30 states across the country are exploring RUC as a potential new transportation funding model. Each of these states is exploring RUC feasibility in varying ways—ranging from initial revenue forecasts to full, statewide pilots for up to 5,000 vehicles. In addition, in 2016 the federal government allotted nearly $15 million in grant money, allowing states and regions to study alternative funding mechanisms, such as RUC. 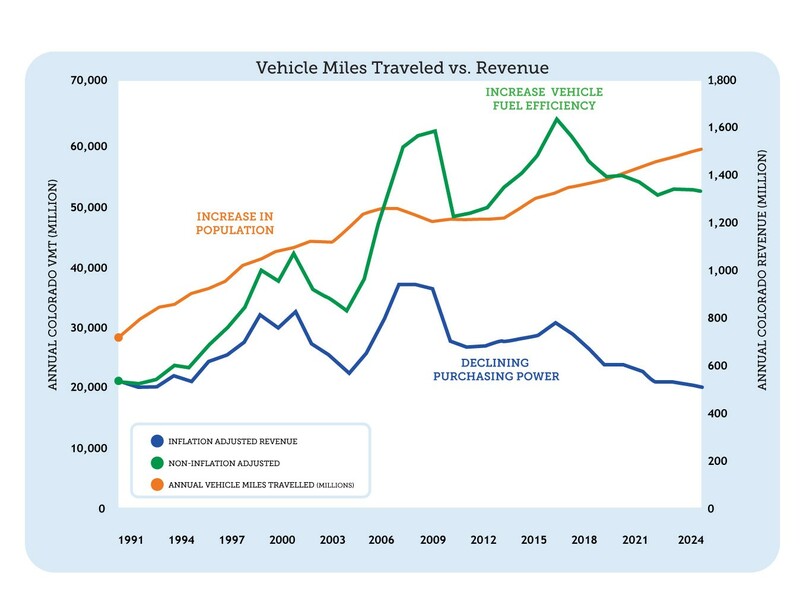 What is the Road Usage Charge per-mile rate, and will it increase over time? The Road Usage Charge per-mile rate for the Colorado Road Usage Charge Pilot is 1.2 cents per mile. The calculation for the per-mile rate is based on the total Colorado state gas tax revenue, divided by the total vehicle miles traveled by Colorado passenger vehicles fueled by gasoline (based on 2014 data). The rate was calculated specifically for the pilot and is illustrative only; no money will be exchanged as part of the Colorado RUCPP. All payments and/or fuel tax credits will be simulated. A per-mile rate for a road usage charge system would be determined by the Colorado State Legislature. Why would drivers of high-fuel-efficiency vehicles volunteer for the Pilot Program? The condition of Colorado roads is a burden shared by all, regardless of the fuel efficiency of their vehicles. The average Colorado driver pays up to $737 annually in extra vehicle operating costs, including accelerated vehicle depreciation, additional repair costs, increased fuel consumption and tire wear due to the poor condition of Colorado's roads. The current transportation funding gap (approximately $1 billion per year over the next 25 years) does not allow for CDOT to adequately maintain Colorado roads. This gap is partially due to the increase in the number of fuel-efficient vehicles in Colorado, which do as much damage to the roads as lower-fuel-efficient passenger and light-duty vehicles. Transitioning to a user-based solution like RUC, would help realign the funding model and allow for more monies to road maintenance and repair. The California and Oregon state RUC pilot programs have shown drivers of high-fuel-efficiency vehicles are in favor of paying a road usage charge because they recognize they are contributing to wear-and-tear on the road. Drivers have also noted they bought their high-fuel-efficiency vehicles for other benefits beyond saving money on the state fuel tax. Could this be a permanent program? The Colorado RUCPP was a four-month pilot which ended in April 2017. CDOT was awarded a federal FAST Act grant in 2017 to run a larger pilot. If CDOT receives the grant, the second pilot would begin in late 2018, and would focus on partnering with the Colorado Farm Bureau and other state agencies to research and address issues that were identified in the initial study. Also, CDOT is a member of RUC West, a consortium of 14 Western states, and is participating in the RUC West Regional Pilot to address out-of-state driver issues. Any decisions regarding future research, studies, pilots or programs for road usage charging in Colorado are determined by the Colorado State Legislature in conjunction with the governor. The information provided from the Colorado RUCPP may be used by the legislature to evaluate if future pilots or programs should be considered. Will I be paying more tax dollars with the RUC than I do in gas tax? While no actual payments were made for the Colorado RUCPP, the answer to this question is, "It depends on your vehicle's fuel economy (miles per gallon)." You can review information on the EPA's average MPG rating for your vehicle. RUC only charges for miles driven and does not account for vehicle fuel-efficiency, as the gas tax does. Since those who drive highly fuel-efficient or electric vehicles pay very little or no gas tax, those drivers might pay more under an RUC program. On the other hand, the driver of a larger, older or less-fuel-efficient vehicles might pay less under an RUC program. **Under an RUC Program, drivers will be reimbursed for state gas taxes paid. Why would drivers of high-fuel-efficiency vehicles volunteer for this Pilot Program? The condition of Colorado roads is a burden shared by all, regardless of the fuel efficiency of their vehicles. The average Colorado driver pays up to $737 annually in extra vehicle operating costs—including accelerated vehicle depreciation, additional repair costs, increased fuel consumption and tire wear due to the poor condition of Colorado's roads. The current transportation funding gap (approximately $1 billion per year over the next 25 years) does not allow for CDOT to adequately maintain Colorado roads. This gap is partially due to the increase in the number of fuel-efficient vehicles in Colorado, which do as much damage to the roads as lower-fuel-efficient passenger and light-duty vehicles. Transitioning to a user-based solution like RUC would help realign the funding model, and allow for more monies to road maintenance and repair. Is RUC another tax on top of the state gas tax? No. RUC is intended as a replacement to the state gas tax. For the purposes of the Colorado RUCPP, gas taxes paid—as calculated by the fuel consumed when traveling on Colorado roads—will be shown as a credit on the participant's simulated invoice. No actual payments or credits will be made for the Colorado RUCPP. Was revenue generated from the Colorado RUCPP? No. Revenues were not collected as part of the Colorado RUCPP. Will I be charged for driving on out-of-state or private roads? It depends on the tracking methods used. If the GPS-enabled mileage-reporting device option is chosen (with location-determination electronics via GPS), the device will identify any out-of-state mileage, and those miles will not be reported on the invoice. The other two options used in the pilot (non-GPS-enabled mileage-reporting device, and manual odometer read) options did not distinguish between in-state and out-of-state mileage. The Colorado RUCPP is focusing on key elements to demonstrate the feasibility of RUC in Colorado. Therefore, all roads will be treated equally, so miles driven on private roads will not be differentiated. The final report for this pilot will provide considerations for further study or for future RUC pilots. Will a Road Usage Charge be unfair to lower-income drivers? If income level is a barrier to purchasing more fuel-efficient vehicles, those driving older or less-fuel-efficient vehicles will typically pay less RUC than they would in gas tax. How do out-of-state drivers pay for their share of the roads? Out-of-state drivers will continue to pay their share through the state gas tax. The Colorado RUCPP is only for Colorado residents and doesn't address the issue of miles driven by out-of-state drivers. The final report for this pilot provides considerations for further study or for future RUC pilots. Why not just raise the state gas tax? Colorado is considering increasing the gas tax as a short-term solution to the current transportation funding problem. While raising the state gas tax might be a good short-term option for increasing revenue, it fails to create a long-term and sustainable solution to the problem. New federal corporate average fuel economy (CAFE) standards require new vehicles to get 54.5 miles per gallon or greater by 2025. As consumers continue to buy highly fuel-efficient vehicles, they buy less and less fuel, and Colorado's revenues collected from the gas tax continue to decline. The Colorado RUCPP researched whether RUC is a fair and sustainable solution to the problem.